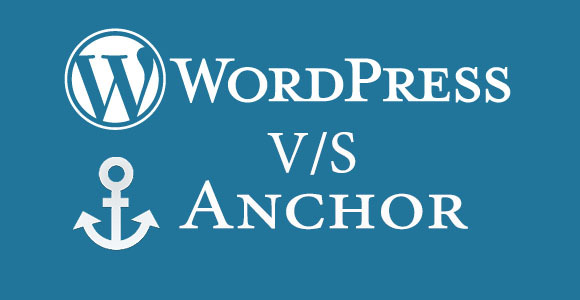 WordPress Vs Anchor CMS – Which Blogging Platform should you Use? When it comes to look for the most popular content management system or blogging platform, WordPress probably tops the chart and that too by an enormous margin. According to a recent study, it has more than 54% share of the market. However, being amazingly popular does not necessarily mean that it is the best. Despite the dominance of WordPress, it is always worthwhile to know your way around one or two alternatives in the wonderful world of blogging platforms. Many new content management systems are now gaining traction. Anchor CMS is one such incredibly simple and lightweight blogging platform for art-directed posts. Should you try Anchor CMS instead of WordPress? Of course, at just 170kb, Anchor is the smallest and fastest Content Management System out there. It has unbelievably faster page load time and database query optimization in comparison to leading CMSes such as WordPress, Joomla, Drupal and the like. Anchor is an extensible, open source blogging platform with a very simple, uncluttered and no-frills admin interface that simply allows you to write without any fussiness. Compared to WordPress, Anchor has a highly powerful and simple theme engine to endow your website with an exquisite charm that makes blogging beautiful. Nevertheless, WordPress is a better option when you are working on larger non-blogging or corporate websites. WordPress is a way forward than Anchor CMS as it can be used in a large number of applications and it even furnishes you with a plethora of extensibility options. Anchor CMS is the best choice when you want to design custom posts and blogs because of its ease of use and customizability. What Makes Anchor CMS different from WordPress? What we look for in a content management system is simplicity. Anchor CMS is still in its infancy but it has a vast potential to grow in the realm of blogging platforms. Anchor, a simple database driven blogging engine, has outperformed WordPress, a benchmark in CMSes, in terms of installer zip. While it takes five minutes to install WordPress, you can have your Anchor up and running in just two minutes! Installing Anchor is a breeze, it asks for a few settings and you are good to go within a moment provided you have PHP 5.3 and MySQL database. However, if you look under the hood, you will find that a plenty of features are missing in Anchor CMS. By far, Anchor has the smallest theme repository. Unlike WordPress, it does not even support plug-ins though it is extensible and you can add or remove any number of custom fields to your post or page on the blog. Anchor should even include categories and tags as these are the two vital taxonomies for any CMS. WordPress is a very complex and heavy content management system but it works brilliantly in handling large corporate websites and blogs. Anchor CMS on the other hand is a tiny blogging platform that is great for creative and art-directed posts. Choosing the right platform depends solely on your requirements. You can pick the one that best suits your needs. The following infographic shows the popularity of WordPress and Anchor CMS on twitter. Word Press has the lion’s share of the top websites and the number of twitter followers testify the fact. Due to the popularity of Word Press all over the world, there are about 259,728 followers of WordPress and 1060 followers of Anchor CMS.